Vantage Learning is proud to provide programs which provide students with lessons they will carry with them through the rest of their lives. Our programs allow your students to learn at their own pace to ensure they get the most out of every interaction. These Web-based applications empower students to learn through practice and guided instruction while giving parents the tools they need to monitor their progress. Dynamic computer-based scoring allows students to complete, review, and refine their work without a teacher or parent needing to review every submission and score it by hand. Instead, parents and teachers remain dedicated to student achievement by focusing on lesson plans and students’ individual needs. A full featured writing and grammar learning suite that guides students through the process of writing. Students can work through a number of writing related activities and receive points based on their achievements. From a central login, parents and teachers assign any of close to 100 writing prompts for their student to respond to. Students receive instant feedback which details the strengths and weaknesses of their writing, giving them a comprehensive picture of how they can revise and improve their writing. Parents and teachers can view full reports detailing student progress across every assignment, so student progress is easy to track and curriculum can be easily changed to address the student’s specific needs. Combining guided practice with self paced instruction, MY Access!® College Prep puts students in control of their writing. 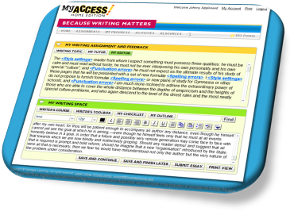 Students are given their own login from which they can access writing activities and prompts which are targeted to advanced English writers. Instruction is geared towards the expectations college writing, namely the analysis of facts and showing greater interpretation when responding to assignments. Full reporting options allows your students to track their development and know where they need additional focus and refinement. 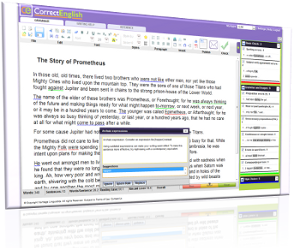 CorrectEnglish® is an industry-leading word processor, personal publishing, and writing feedback tool. Going far beyond a traditional spelling and grammar checker, CorrectEnglish® breaks down writing on the fly. It identifies words, phrases, and sections of text that require attention, providing an overall picture of writing readability and strength. Writing is supported either through typing within the application or importing a document written by another word processing application. Once completed, work can be printed, e-mailed, or even published to blogs linked to the CorrectEnglish® account. The premier guide for writing and the tool for publishing, CorrectEnglish® is the ultimate solution for making your voice heard. 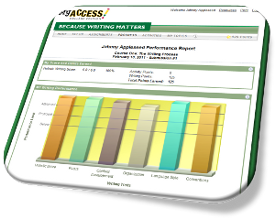 MY Access!® Professional Edition helps business school students write purposefully, powerfully, and persuasively. Endorsed and supported by the Graduate Management Admission Council® (GMAC®), MY Access!® Professional Edition will improve your business writing skills and give you an edge on your competition.